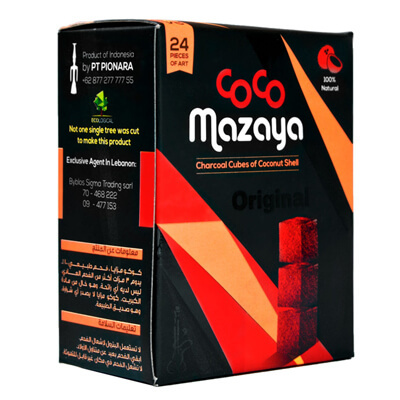 CocoMazaya is a line of cube natural coconut hookah charcoals produced by CocoNara Coconut Charcoals. 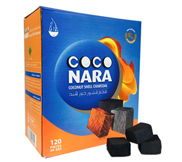 This cube version of CocoNara contains the same quality as CocoNara hookah charcoals with minimal ashing and no foul odor or flavor. These charcoals are made for hookah smoking and contain no additional chemicals, just simple, clean coconut husks. CocoMazaya Coconut Charcoal is available in a 24 Piece Box as well as a 96 Piece Box. The CocoMazaya 24 Piece Box allows for you to sample this authentic Coconut Charcoal at an affordable price. It is recommended that you heat the charcoal on an electric stove, hookah charcoal burner, or open flame before every smoke.